Possessing an interest in music of all genres and origins, Steve embraces the process of creating new works with artists of varied disciplines and traditions. 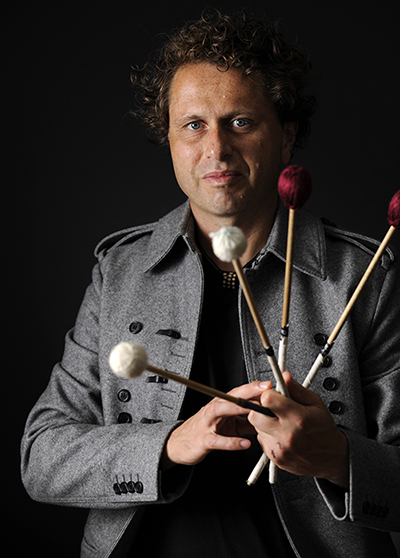 In addition to his work with contemporary classical music ensembles such as Speak Percussion, Chamber Made Opera and the Bolt Ensemble, he often performs with leading contemporary improvisers both within Australia and in Japan (where he lived between 2005 and 2011). Steve attended the Victorian College of the Arts Secondary School, Victorian College of The Arts, Queensland Conservatorium of Music and later, Toho Gakuen College of Music (Tokyo) where he studied marimba with the renowned soloist and composer Keiko Abe. Steve has played percussion with the Melbourne, Queensland and Tasmanian Symphony Orchestras, Orchestra Victoria and Orchestra Ensemble Kanazawa (Japan) and has also worked for many musical theatre productions including “Mamma Mia!” and “We Will Rock You”. As musical director of the popular Australian dance show "Tap Dogs", he travelled to New Zealand, Japan, China, Korea and India. At the "Dance Triennale Tokyo 2009", he performed the important minimalist composition "Drumming" by Steve Reich in the production "La Vie Qui Bat" by the Canadian dance company, "O Vertigo". Also in Tokyo, Steve and fellow Australian, Andy Bevan formed the world music duo, "Duality" and in 2010, they performed at Kamigamo Shrine, a world heritage site in Kyoto. In 2011 Duality collaborated with Shonosuke Okura (master Otsuzumi player of the Noh Theatre tradition) and Slava Grigoryan (guitar) to create “Four Winds” for the OZAsia Festival at the Adelaide Festival Centre. In 2013, Steve completed a new work for solo marimba titled “A Long Way Home” and was commissioned by Museum Victoria to write for the wonderful Federation Handbells. Currently Steve resides in Melbourne and enjoys his work as a sessional percussion teacher at The University of Melbourne and Monash University.